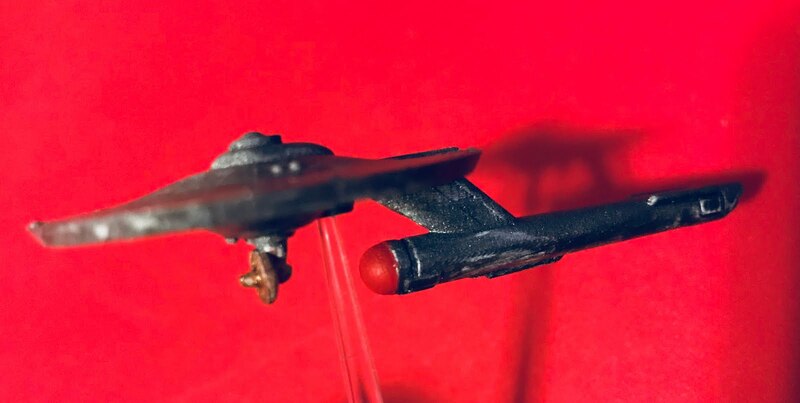 Here's a 3D-printed Federation scout ship, straight from Franz Joseph's Starfleet technical manual! I painted this in the same battleship grey as the last model featured here. I don't have stats for this ship, which limits its utility as a game piece, but I love this design and needed one for my little fleet. I am wondering what your cousin Kieth Langergraber is thinking about all of this. You have nearly enough fleet to enact the Battle of Procyon V, except in the wrong timeline. This looks like a job for The Society Of Temporal Investigations!